Better then the rest because you deserve the BEST! We look to build a long lasting business relationship, and more than half of our relationship will be built through communications for services and support alone. Our pride is to offer you services that will fix the “unknown”, or to assist in “making it happen”. 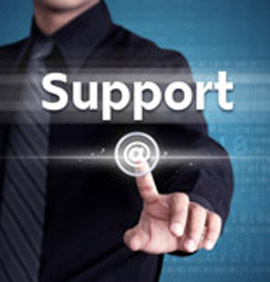 From 24 hour support to annual agreements to prepaid support, there is without a doubt a support option that will fit your needs. This section will review the in’s and out’s of our support options and how RBMS’ services will be of good value. 20+ years of experience in providing support and services has taught us that each client will not fit into one “cookie-cutter” support plan, and have their own needs and expectations for support. For this reason, we have developed 3 options for service and support – 2 annual support agreements and 1 non-agreement plan. RBMS offers 2 options for annual support agreements – Premier and Basic. Details of what each plan covers are explained over the next 2 pages. 45 days prior to your warranty period or annual agreement is due to expire, we will send out your renewal package detailing your options and costs for the upcoming year. The maintenance agreements will include detailed charges for Software Support, Hardware Support and NCR CounterPoint Subscription Service Renewal.